Kalyani University was established in the year 1960. It has been a leader in providing quality education and incorporating key skills in the students. The university is well equipped with experts teaching in the university, maintained infrastructure and a firm eye for carving their student’s future. University has collaborated with IGNOU and other universities of West Bengal has started Directorate of open and distance learning (DODL) It is a well-known name in the region and takes students from anywhere. Quality education and a disciplined environment of the course helps the students to develop key skills required for succeeding in the field. It has been an important educational hub for the state and for the country and with the launch of its distance education program the university is planning to expand its horizons. The program provides several courses in different fields and provides teaching aid for them. The program gives study material to the students which are very comprehensive and easy to understand. The courses are focused mainly on developing key skills and educating students so that they can find suitable jobs that will help them in living a respectable life. 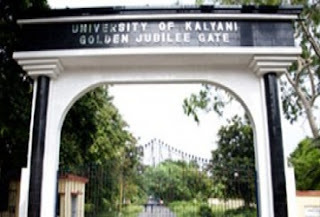 Kalyani University has launched a number of courses and for applying to them, applicants have to download application form from their website. After downloading and filling out the form, they have to be submitted online or in person at university counter. Download link can be easily found on the website and you can directly download it from there. There is no age restriction for the courses however the limited number of seats makes the selection procedure solely on merit basis. The course material and teaching aids are provided by the university. Reading material is specially made so that the students can understand them easily and grasp the contents of the course. It will help them in developing key skills. The submission of form requires a small amount of fees to be submitted along with your application form. After submitting the application form, it can be checked and tested on various eligibility criteria. Applicants who clear all the criteria are offered with admission.